Friends of the Inyo Executive Director Wendy Schneider sat down to talk with Eastern Sierra 4WD Club President Mike Johnston to learn more about his thoughts on the relationship between the OHV and conservation communities and the best way to move forward with helping each other to protect and care for our Eastern Sierra public lands. So, how did you get to the Eastern Sierra? Like a lot of the people here, I’m a transplant. I grew up in Palmdale. At that time it had one traffic light. I decided to leave the corporate world in 1990. People were shooting each other on the freeway, it was time to get out of the big city. We owned a home in Bishop, loved being in the Eastern Sierra and decided to relocate here permanently. We had two kids, in 5th and 6th grade when we moved. Once we set up shop in Bishop, I started my own business as a general contractor, it was called J & J construction. I ran that for about 7 years and then did real estate until I retired 6 years ago. How did you get involved with the Eastern Sierra 4WD Club? I joined the Eastern Sierra 4WD club in about 2000, it used to be called Mammoth Lakes Eastern Sierra Four Wheel Drive Club. We used to meet at Water Department in Mammoth. The club has since shortened the name to just the Eastern Sierra 4WD club. Meetings are monthly in Bishop and membership in the club is about 65 people. We travel throughout the Eastern Sierra with an outing every month. We choose the location based on the weather, and try to avoid the snow. They made me president in 2010. I think I might be the 4th president. It’s supposed to be a one-year term but mine keeps getting renewed. 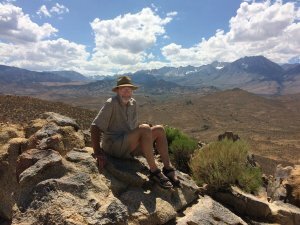 How did you get connected with Friends of the Inyo? Well, it was not too long after I joined the 4×4 Club. At that time the Friends of the Inyo office was next to what is now the Great Basin Bakery. One day I saw your logo and realized that I really connected with it: Preservation, Exploration, Stewardship. I thought “Hey, that’s me! I agree with those principles!” So I walked in and introduced myself to Paul McFarland [FOI’s Executive Director at the time]. I wanted to learn more about you guys. And it was great to meet Paul, I have always enjoyed talking to Paul. In truth, another reason I walked in that day, was because I thought you might need some help hearing what the 4WD community has to say. I wanted to contribute to the ongoing travel management debate from the off-road side, but also hear what you have to say. Tell me about your participation in the travel management process that was happening at that time. Since I’ve been in the Eastern Sierra, I have participated in 80 to 90% of Forest service meetings about OHV activities, but I was not part of the Collaborative Alternative Team (CAT). I supported the compromise produced by the CAT, in fact I thought it was amazing that Jim Upchurch [Inyo Forest Supervisor in 2009] pulled it off, got the groups together, got a collaborative decision. There was no appeal of the decision, there were no lawsuits. Many people were unhappy, but it was a compromise, it was really amazing that the agreement got done. Of the approximately 1400 miles of roads the Forest Service claimed were previously unidentified, the team agreed to close about 600 miles, and to keep open, and make official, about 800 miles of roads. It was an effective compromise and I have supported the agreement reached. It is done and we need to move forward. The relationship between Friends of the Inyo and and the 4WD community became very strained after the compromise was reached. Why do you think that happened? When it came time to implement the CAT agreement, Friends of the Inyo got a OHMVR grant and entered into a contract with the Forest Service to go out and do the work on the ground to close the roads. Friends of the Inyo were the ones carrying out the closing process. Many in the OHV community were not aware of the CAT process, had not participated, all they saw was Friends of the Inyo out there closing roads. I remember that the 4×4 Club went out with Friends of the Inyo once, to Coyote. We jointly put up various different signs, and Friends of the Inyo supplied lunch. If we had done more of that, more outreach, more communication, more working together, things might have gone much more smoothly. As evidenced by significant participation of 4×4 Club members and Friends of the Inyo with joint stewardship events over the last few years, we believe our efforts to improve the relationship between our groups are working. How can we best move forward to continue to improve our relationship with the OHV community? I think we need to educate both sides more. The OHV community would like to make environmental groups aware that we consider ourselves environmentalists, that is, a good quality environment is important to us. I don’t think the environmental groups know how much stewardship the OHV community does. We go out and plant bitterbrush and engage in other activities to repair damaged areas. Also, we want people to understand that the OHV community puts a lot of monetary resources into the protection and maintenance of public lands. All of the non-street legal OHVs (ATVs, dirt bikes) pay a green sticker fees to operate their vehicles. The money collected from these fees goes in large part to fund maintenance, law enforcement and restoration work on public lands. In fact, there was approximately $1.6 million of this money (OHMVR grants) that was allocated between Inyo and Mono Counties in 2017. How do you think the future looks for off-road recreation in the Eastern Sierra? We live in a wonderful area and our society needs to get outside more to enjoy and appreciate mother nature. The 4×4 and ATV markets are expanding and I expect we will see more of these vehicles on our dirt roads. Mountain bikes are also becoming very popular. Unfortunately, in 2016, many years after the finalization of the CAT agreement, Ed Armenta (then the Inyo National Forest Supervisor) felt that he had to conduct a new Travel Analysis Process (TAP), and submit a new Travel Analysis Report (TAR). In his report, Armenta opined that some of the roads left open by the CAT agreement were in fact not needed. So while Armenta had always said publicly he would support the CAT agreement, he ended up submitting this report that did not fully support the compromise. No action seems to have been taken based on the report but it violated the CAT agreement. Another issue is, as time has gone by since the CAT agreement, we believe that perhaps the closure of some of the roads should be re-visited. Pursuant to the CAT agreement, about 2.5 million dollars (OHMVR grants) has been spent on road restoration on the Inyo National Forest. I see that some roads are being closed by the Forest Service, and then re-opened by users, multiple times. This is a waste of time and money. Some re-evaluation is in order at this time. What suggestions do you have for better care for our Eastern Sierra public lands? For hikers, backpackers, mountain bikers and OHV users I would like to see more trailheads. If there were more trailheads, people could spread out and impact the land less. Right now there are so few places to go, people are on top of each other and really damaging the areas with trailheads. If we open up more trailheads, we can spread out the traffic. I would also like to see more monitoring of public lands use by the Forest Service. They are so understaffed now, there is no effective monitoring taking place. I have always enjoyed the people at Friends of the Inyo, everyone I have worked with has been congenial and open-minded and it has been good to work with them.